Acupuncture works by stimulating nerve fibers in the body that trigger the release of pain blocking neurotransmitters and increase circulation to different areas of the body. A one inch, VERY tiny needle is inserted using a plastic insertion tube approximately 1/8 of an inch into specific spots throughout the body. Acupuncture is usually painless, however, there may be a “mosquito bite” type sensation with the insertion of the needle with no real discomfort afterwards. Treatments are typically 20-30 minutes in length and could be anywhere between 1-3 time per week. The risks of acupuncture are low if you have a certified practitioner administering the needles. Possible side effects may include soreness, bleeding or bruising at the needle sites. 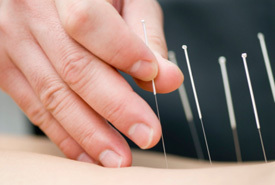 Get started with acupuncture at our Hoffman Estates office! Contact us today.